Plant Turbinicarpus schwarzii 1809 (10,5) from Dušan Hrovatin's personal collection of cacti is offered by the WYSIWYG principle (providing the exact image of the plant before you order it). 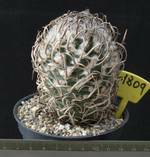 Turbinicarpus schwarzii 1809 (10,5) sprouted in 2000 and is available for only25.00 €. Razprodajam zbirko več kot 15 let starih kaktusov. Na voljo je 1 rastlina. I sell a collection of more than 15 years old cacti. It is available1 plant. The last example!